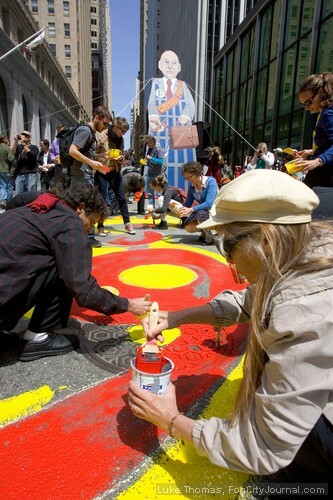 Occupy protesters gathered at Montgomery and Market streets at noon on May Day, painting a large and colorful mural on the intersection that read "Rise up, 99 percent." Photos by Luke Thomas. 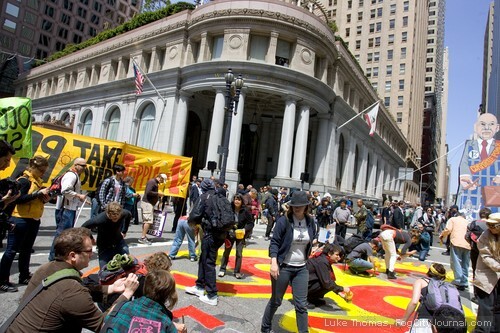 Leaving downtown Oakland at the end of May Day, some Occupiers had mixed feelings. 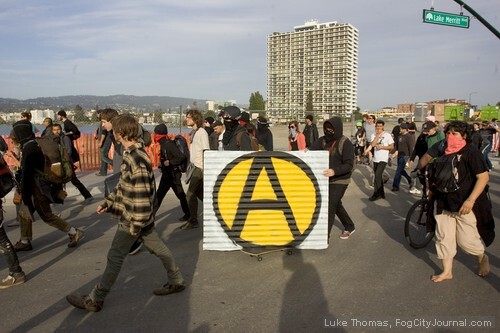 Lingering in their minds was the unwelcome violence perpetrated by an anarchist group known as the Black Bloc which vandalized small businesses, parked cars and broke windows at Mission Street police station following a peaceful event held at Dolores Park in San Francisco on April 30. On May Day, violence marred a peaceful yet boisterous rally in Oakland when Oakland police officers attempted to extricate a protester who had previously been issued a stay away order, according to police. Video from the scene shows police officers pulling a girl off her bicycle and arresting her. “Stop hurting me – I was just riding my bike,” the girl wails as officers make the overly forceful arrest. When the officers were subsequently surrounded by angry protesters, officers released tear gas and flash bang grenades to disperse the crowd. 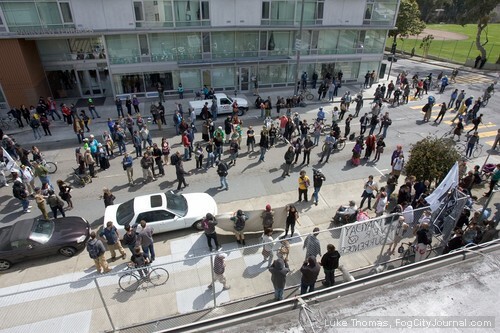 Adding to the day’s troubles, a man described as mentally unstable threw bricks at protesters from the roof of 888 Turk Street, a former mental health clinic owned by the Archdiocese of San Francisco, which was occupied for a second time with the intent of turning the 5-year vacant building into a homeless shelter and community center. Police arrested and removed 26 occupiers from the building in a pre-dawn raid Wednesday without incident. 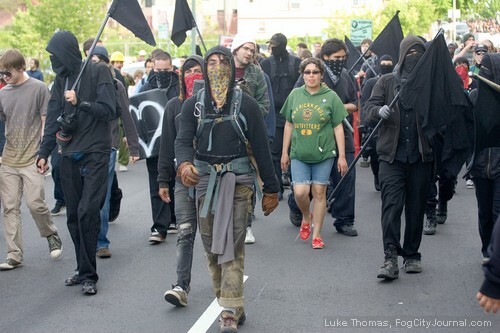 But May Day was also one in which thousands attended mostly peaceful, non-violent protests in support of immigrants, workers and others who comprise the 99 percent of Americans who feel they are at the mercy of an unregulated capitalist system run amok by unfettered greed and political corruption, a system that benefits the few over the expense of the many. 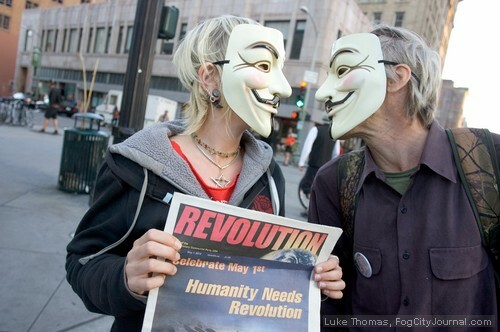 It was also the first International Workers’ Day since the Occupy movement started in September in New York City which formed to protest publicly-funded bailouts of the very banking institutions that are largely being blamed for causing the deepest recession since the Great Depression. “We’re all in it together,” Michael Engemann, 53, a former laser technician, said at the Larkspur Ferry Terminal during a partial-day strike. A handyman since losing his job, Engemann made sure to not work on May Day, and was planning to attend many of the day’s activities. 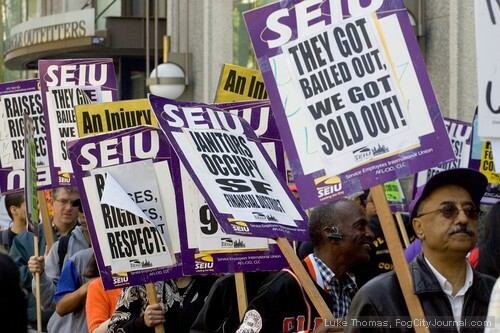 Though Engermann is not part of a union, he participated because of Occupy’s call, and took a chartered bus at 6am from San Francisco along with other union-striking supporters. 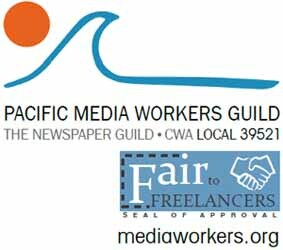 The ferry strike by the Inlandboatmen’s Union is supported by a 14-union coalition that works for the Golden Gate Bridge District. 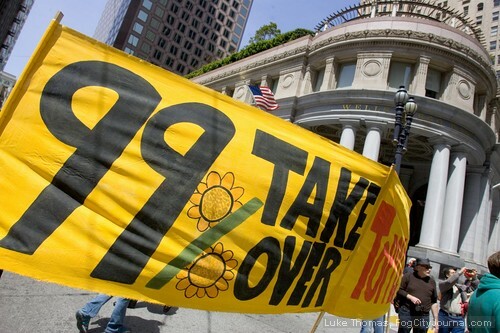 Occupy Oakland had decided to support a strike that could have closed the Golden Gate Bridge, but over the weekend the Golden Gate Bride coalition asked for the bridge closure action to be called off. The Larkspur terminal was largely empty, except for police and more than 100 sign-carrying picketers. Drivers honked in support while others drove by and cursed. 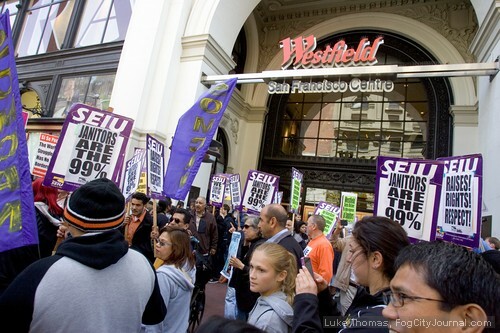 By mid-morning the Occupy buses departed Larkspur and joined a protest held at the Westfield Shopping Centre in San Francisco. 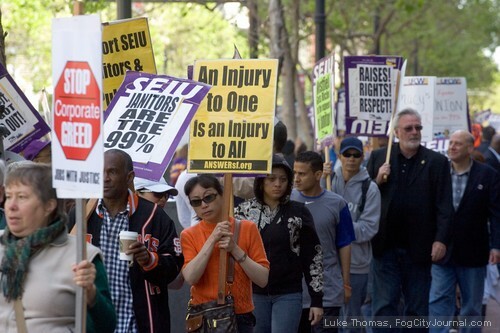 The protest was organized by a variety of unions and advocacy groups, with many there dressed in their purple shirts from the Service Employees International Union, which includes janitors. “Enough of the race to the bottom,” said United Food and Commercial Workers Local Five President Ron Lind. 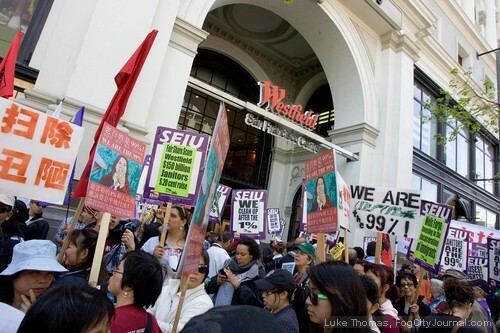 Union workers and Occupy demonstrators combined in solidarity to protest cuts to worker benefits at Westfield mall. The protesters then marched to a festival at Montgomery and Market streets in front of a Wells Fargo bank. Demonstrators closed the street, painting “Rise up! 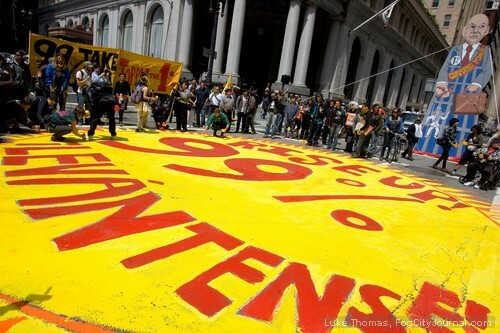 99 percent” on the ground with bright yellow and red paint. Music played, speakers talked about their struggles from a sound truck. Those who brought T-shirts could get them silk screened in commemoration of May Day. 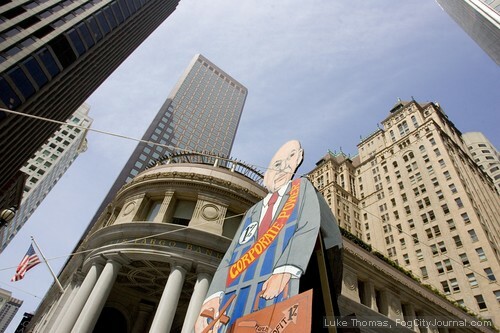 A 30 foot effigy of a man representing corporations was raised. Holding a briefcase in one hand and puppet strings to the government in another, the effigy was held in place by connected ropes. 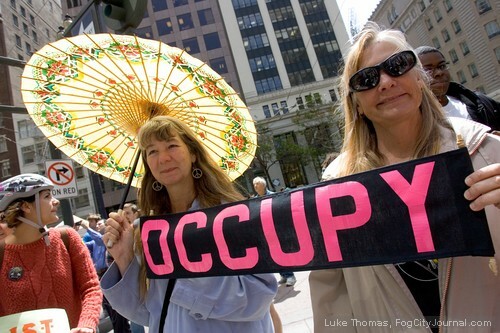 Occupy demonstrators converged on Montgomery and Market streets in downtown San Francisco to protest corporate greed. 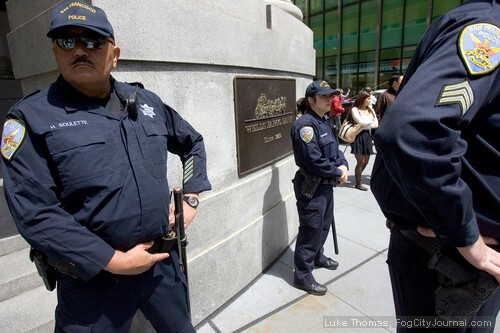 San Francisco police formed a cordon around Wells Fargo bank. From there some protesters went to the Turk Street building takeover, while others went to Fruitvale BART for the regional March for Dignity and Resistance into downtown Oakland. Multiple sound trucks and other vehicles drove among the marchers. The marchers stopped along the way at San Antonio Park where food was provided. Others passed out flyers and information including efforts to stop schools from closing. Portable toilets had been set up in advance. 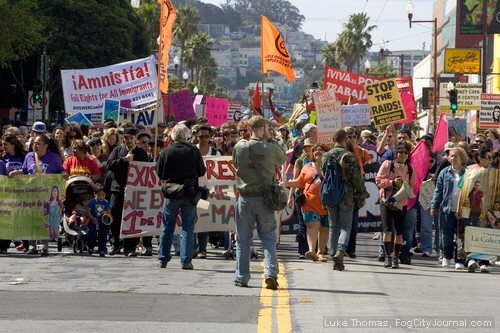 Occupy SF demonstrators head along Van Ness Ave to 888 Turk Street. 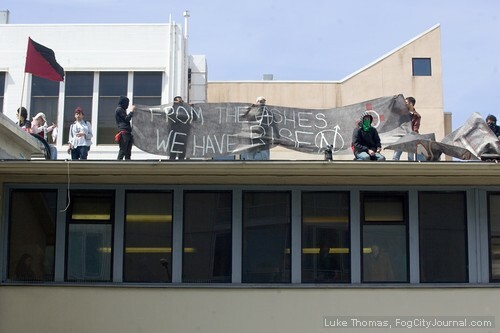 A banner atop the roof at 888 Turk Street read, "From the ashes, we have risen." 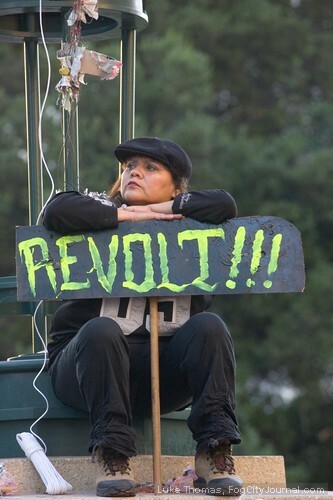 Atop the roof of 888 Turk Street, an anonymous protester salutes the crowd below. 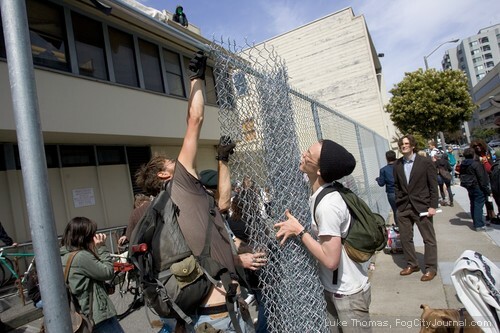 Occupy protesters removed a chain-linked fence erected following the previous occupation of the building in April. 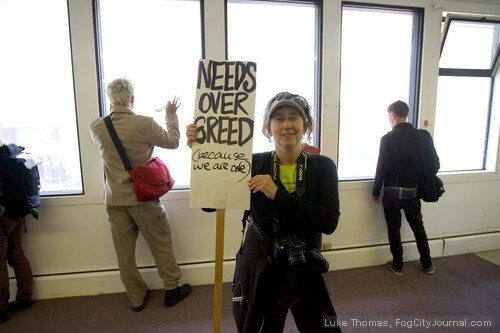 Inside 888 Turk Street, a protester held a sign that read, "Needs over greed, because we are one." 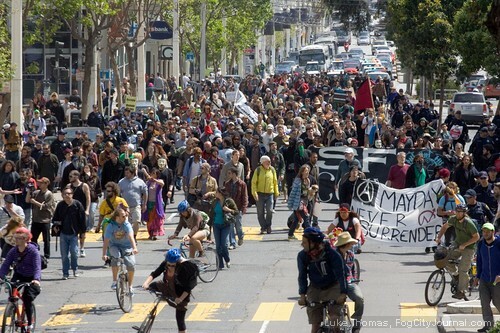 Oakland protesters make their way to Frank Ogawa Plaza along Lake Merritt Blvd. 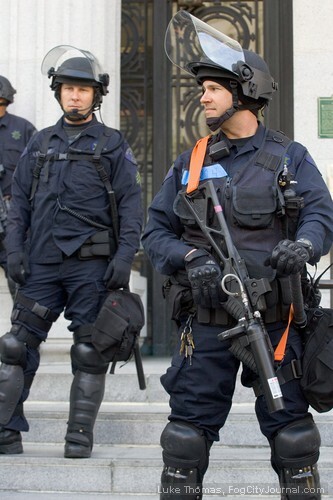 Masked demonstrators marched to Frank Ogawa Plaza where police, armed with riot control devices including an LRAD sonic weapon, awaited their arrival. 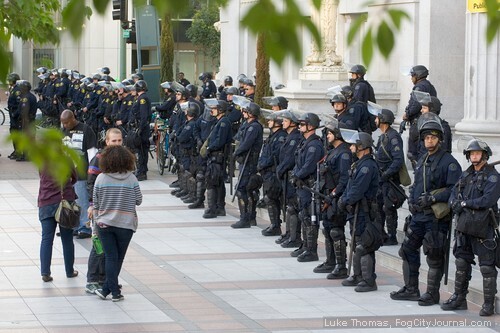 A phalanx of police stood outside Oakland City Hall. 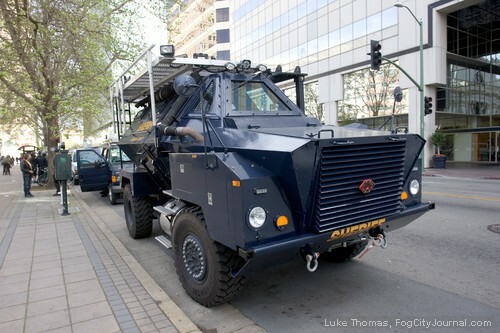 A military-style all terrain troop carrier emblazoned with a BlackwaterUSA logo and carrying a long range acoustic device (LRAD) was parked at Frank Ogowa Plaza, aka Oscar Grant Plaza. Police were armed with a range of riot-control devices. Police mainly stayed behind, with officers grouped into white vans. Helicopters hovered both overhead and in the distance towards downtown. Some marchers began to leave as nightfall neared, but eventually thousands made it to downtown. The mood near Frank Ogawa Plaza was festive, with music blaring as demonstrators dancing while blocking the intersection at 14th and Broadway streets. Police announced demonstrators could stay until 10pm. Stephanie Tang, a teacher from San Francisco in her 50s, said Occupy has done a lot in getting people to talk about inequalities and changing the system. 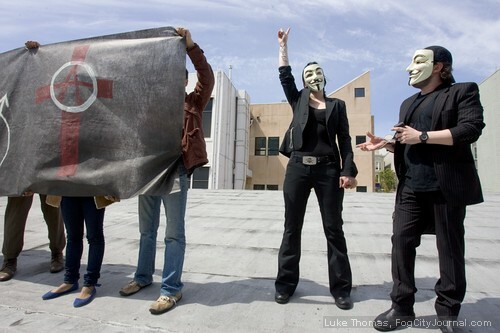 As for what would come next, she said that’s unknown, especially since Occupy is a leaderless movement. “The future is unwritten,” she said. But around 9:30 pm police said they were attacked while arresting someone who was ordered to stay away from the plaza. That’s when the situation went off, with cops in riot gear clearing the streets. Throughout the night police then pushed people out of the plaza area, with some being arrested blocks away. Witnesses said those arrested were disobeying police only in that they could not disperse fast enough because of the crowd. 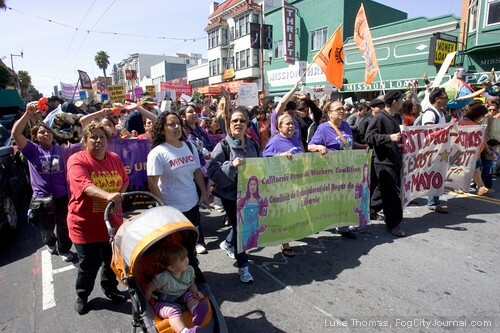 In San Francisco, immigrant's rights protesters marched along Mission Street. 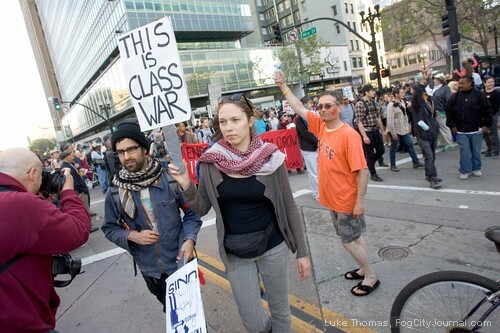 In Oakland, a protester at the intersection of Broadway and 13th streets carried a sign that read, "This is class war." 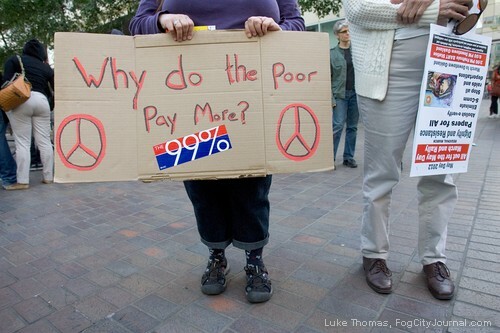 A protester held a sign that read, "Why to do the poor pay more?" 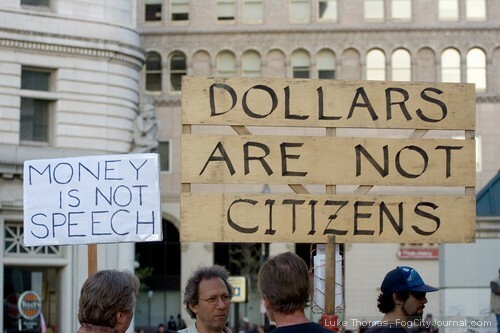 Protesters held signs that read, "Money is not speech," and "Dollars are not citizens," referring to the US Supreme Court's decision in Citizens United v. Federal Election Commission which prohibits the government from restricting independent political expenditures by corporations and unions. Eric Louie is a reporter based in the San Francisco Bay Area. His work has appeared in Greenbiz.com, Contra Costa Times, The Record ( (Stockton), Philippine News, Pacific News Service and the Sunset Beacon. 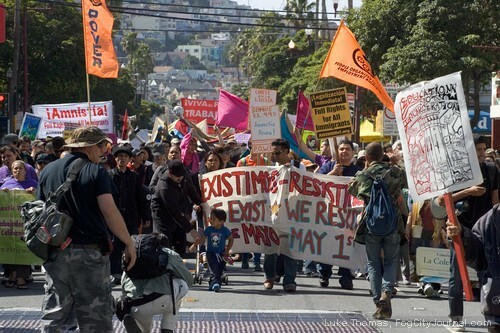 Comments for Bay Area May Day Protest Action Marred by Pockets of Non-Occupy Violence are now closed. Thank you for your email. I have forwarded your comments to the News Director. You know, as much as this article talks about all the people coming out for May Day because of occupy, and indeed there may be thousands, there are not tens or hundreds of thousands that are really needed. And if you look at the mainstream media, all you see are those incidents of violence. That’s is really all that is portrayed. It does not matter that some unemployed guy is empowered so much as thousands of working class and middle class people are fed the notion that Occupy is a bunch of criminalistic morons destroying small businesses and cars parked on streets. People think, “Hey, that could be my car.” Or hey, that’s the coffe shop I go to (or my mother, or grandmother) goes to.” If Occupy cannot deal with these destructive idiots, then no matter that even ten thousand disenfranchised and marginalized people come to events, there will be no real movement build, no true grassroots swelling and it will remain a marginalized and ineffective movement. And I say this knowing full well that it all plays into the hands of the corporate, militarisitc and rightwing handbook of deviding and conquering. I have no doubt that agent provocators are at work here. And if it is not police, mercenary or fascist infiltration, then it is just plain stupid and those people should be put out of anything Occupy!! Honored to have my sign included in this story. I’m musing about the terms “protestor” vs “demonstrator”. I guess I am both if I am protesting the system…which I can’t deny that I am…But I feel much more aligned with the term demonstrator. As an artist, I know all too well the value of vision, and how important it is to articulate one especially if one finds oneself in a leadership position…My sign (needs over greed because we are one) was my statement of this vision, but our behavior (whether you are in the protest camp or the demonstrator camp) can be a powerful indicator too: Will you be civil or will you be violent? Because if you are aligned with the Occupy movement but choose to be violent, you are in fact revealing that in some way, you are still aligned with the very system you are purportedly protesting. But if you model nonviolence, then you actually are a demonstrator because you know that the same impulses that got us in the mess we’re in cannot be the ones we use to get out. I deplore the news stations that choose to cover the violence over the substance. I found that to be the case with KTVU TV the night of the actions. I was interviewed by them, but the brick-thrower got top billing. Same with Oakland. I know most of Occupy is nonviolent, but am still disheartened whenever I see Occupy commentary or language to the contrary. Some things have to be worked on internally and over time in order to change behavior—there is no quick fix. So I hope the movement gels around this more and more, and I’ll get that letter out to KTVU about the power and responsibility it has to influence viewers. I was sorry to see the headline on this story emphasize the violence and didn’t post it to my social media pages for that reason, even though the photos were great. I think everyone should consider the possibility that the violence was done by agent provocateurs. KPFA’s Project Censored show did a powerful hour – powerful even despite the interruptions for pledge pitching – about the Kent State massacre this morning. Today is the 42nd anniversary and there’s a call for a Kent State Truth Commission underway. Guests claimed that provocateurs had burned down the ROTC building on the Kent State campus. Also, the FBI sold dummy explosives to those recently arrested for planning to bomb a bridge in Ohio. And hmmm, cutting and pasting that caption seems to have centered and italicized the rest of my comment. But, Luke can worry about that, if you/he want(s) to. The Wikipedia displays the old Blackwater U.S.A. logo and the Blackwater International logo, and if I zoom in on the photo above that caption, I think I may see the Blackwater USA logo in red, on the grill in front of the engine, just above “SHERIFF.” Does anyone know whether that means that Blackwater is now working with the San Francisco Sheriff’s Department, or whether the Sheriff’s Department bought some refurbished Blackwater USA military-style all terrain troop carrier vehicles? I’ve been a little startled, several times, to see similar vehicles passing through San Francisco intersections, with Homeland Security stamped on them even more boldly than “SHERIFF” is on this one. Great photos! I especially liked the one of the cop holding up his pants! !